Classic yule log cake comes in countless flavor combinations. 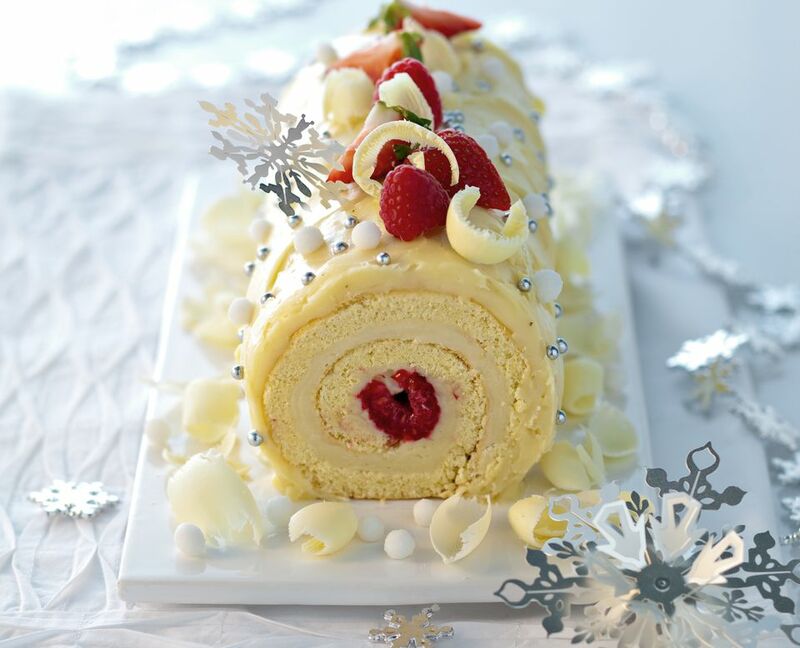 This snowy looking, white chocolate buche de Noel recipe hides layers of airy vanilla sponge hidden under thick, silky white chocolate buttercream frosting. Meringue mushrooms are the traditional choice for garnishing yule log cakes, but this particular cake looks gorgeous surrounded with edible sprays of chocolate twigs, sugar-frosted cranberries, and a light dusting of powdered sugar "snow." Preheat the oven to 400 degrees. Butter a 10-inch by 15-inch baking pan with a 1-inch lip (jelly-roll pan) and line it with parchment paper. Butter the parchment or spray it with cooking spray. Beat the eggs for 5 minutes, until they turn thick and foamy. Add the sugar, vanilla extract, and salt to the eggs and continue beating for 2 minutes. Fold the flour, a few tablespoons at a time, into the whipped egg mixture. Once the flour is incorporated into the batter, stop mixing. Do not overmix or the cake will bake up into a tough texture. Gently spread the batter into the prepared pan. There will be peaks of batter; gently smooth over them, but do not press the batter down. Bake the cake for 10 minutes, until the cake is just set. Invert the baked cake onto a clean, dry kitchen towel and peel off the parchment paper. Wait 3 minutes and then gently roll the cake, still in the towel, starting at the 10-inch end. Melt the chocolate in a double-boiler and allow the chocolate to cool. Add the softened butter, powdered sugar, and salt to a large mixing bowl and beat the mixture on medium speed until it becomes smooth and fluffy. Switch the mixer speed to low and add the cream and vanilla. Beat the frosting on medium speed until it becomes fluffy again. Beat in the melted, cooled white chocolate. Unroll the cake and set aside the towel. Evenly spread 2 cups (or desired amount) of the white chocolate buttercream on the inside of the cake and following its natural curve, gently form it into a cake roll. Cut off the ends of the cake roll on the diagonal and reattach them in the center of the cake with a bit of buttercream to fashion a “branch” coming off the main Yule log. Spread the exterior of the buche de noel with enough white chocolate buttercream to cover it and gently pull a butter knife or small, offset spatula through the frosting to give the appearance of rough tree bark. Add a Pere Noel figure and meringue mushrooms to complete the festive look.